In stock -This product will ship today if ordered within the next 12 hours and 19 minutes. 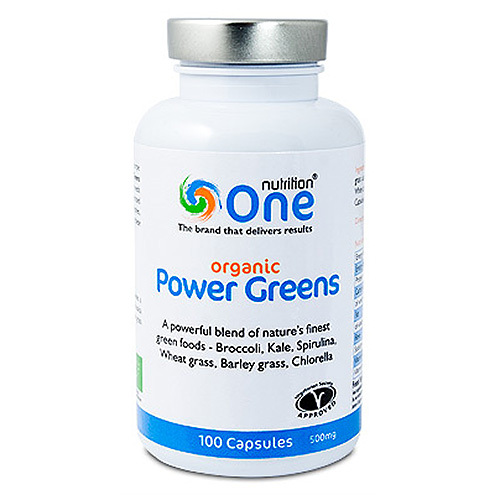 One Nutrition Organic Power Greens provides a powerful blend of nature`s finest green foods - Broccoli, Kale, Spirulina, Wheat Grass, Barley Grass, Chlorella. A potent natural source of raw fuel your body needs to perform at its best every day. By delivering concentrated green food nutrition in a way that suits our modern lifestyles. The One Nutrition range is designed to maintain nutrition when used as part of a healthy diet and lifestyle. Choose from tablets, capsules or easy to mix powders to ensure maximum nutrition and quality. Spirulina*, Wheat Grass Juice Powder*, Barley Grass Juice Powder*, Brassica blend* (powdered Broccoli, White Cabbage & Kale), Chlorella*. 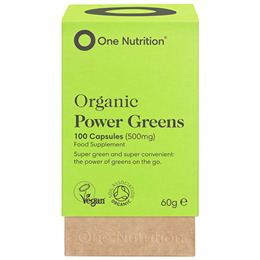 Below are reviews of One Nutrition Organic Power Greens - 100 Capsules - Best before date is 30th June 2019 by bodykind customers. If you have tried this product we'd love to hear what you think so please leave a review. I have been taking these for about a month. I am not sure yet what the actual benefit is. I bought these because I know that my diet is not as good as it could be, and felt it could do with a boost. I certainly don't feel any worse. They are very easy to take. I do think that my energy levels last a bit longer into the afternoon. I did get a compliment yesterday on how nice my skin looked, so maybe the tablets are doing more than I realise. I will know more once I have been taking them a bit longer. I can't really identify what effect Power Greens is having but I am taking it because my appetite had been diminished due to painkillers so I think it can only be beneficial. One Nutrition Organic Power Greens provides a powerful blend of nature`s finest green foods - Broccoli, Kale, Spirulina, Wheat Grass, Barley Grass, Chlorella. A potent natural source of raw fuel your body needs to perform at its best every day.